On November 15th, volunteers organized by Gina Knowles took only forty (40) minutes to find parts of the Piper PA-23-250 Aztec that was being flown by missing pilot Byron Ferguson. NASSAU, BAHAMAS – Royal Bahamas Defence Force (RBDF) Commander Shone Pinder said yesterday that while search and recovery efforts are ongoing for a six-seater aircraft that crashed in waters off New Providence on November 8, those efforts were not being conducted at the same “pace that existed a few days ago”. “Right now, we are continuing our search and recovery efforts, however, what we have done is we have pretty much allowed for our surface craft that are patrolling the area to maintain a lookout for anything that may be telltale signs that [could] assist the Air Accident Investigation [Department] as it relates to any debris or any other significant finds,” Pinder told Eyewitness News. He confirmed that divers were not sent into the water yesterday, and he was unable to say when the next scheduled dive search would take place. Missing pilot Byron Ferguson and the U.S. registered Piper Aztec aircraft went down in waters two nautical miles from the airfield at Lynden Pindling International Airport. Ferguson was en route from West Palm Beach, Florida. He was expected to join his family to travel to Africa in celebration of his father’s birthday. Yesterday, Pinder said until there is an order to suspend, search and recovery efforts will continue in earnest. The Ferguson family and volunteers have continued to search for Byron and the aircraft. Nearly two weeks ago, volunteers and civilian divers found parts of a wrecked plane believed to be from the crash. A GoFundMe page in Bryon’s name was launched on November 17 to hire certified deep-sea divers, and specialized deep-sea dive equipment. To date, $25,000 has been raised. According to the GoFundMe page, a certified diver who was recently flown in via private charter located more debris using specialized equipment and mixed gases in order to dive the edge of the ocean in the area where volunteers found the plane debris. “Volunteer groups have pulled their resources to assist in the search, rescue and recovery of Byron’s aircraft and there is still hope of locating Byron,” read the post on the online fundraising site. In the days following the crash, there was widespread criticisms of the Defence Force’s search and rescue efforts. Last week, Prime Minister Dr. Hubert Minnis said a full review of the protocols, procedures and agencies involved in the crash search and recovery efforts will be conducted. Attorney General Carl Bethel criticised the response of the Royal Bahamas Defence Force to the recent plane crash suggesting the tragedy may not have been “properly” investigated because of how quickly the initial search was called off. His comments in the Senate came shortly before a group of Bahamians said yesterday that their own search team had found pieces of the plane piloted by Mr Ferguson. Mr. Bethel said he would reach out to his colleagues to ensure that whatever “procedural missteps” occurred in this case and others would not happen again. More must be done, he said, to ensure there is a sense of urgency and to drive home the principle of “no stone left unturned" when the country is faced with tragic plane crashes. Mr. Bethel joined fellow Senators Fred Mitchell and Ranard Henfield to voice concerns over the handling of the search and investigation of Mr Ferguson’s plane crash. “The great difficulty right now, particularly with anything that results in a marine landing of some sort, is that the Civil Aviation Department has to rely on the efforts of another agency, usually the Royal Bahamas Defence Force. So in the last crash that occurred off of Andros, as I understand it, the search was called off maybe 50 yards away or so because of inclement weather or something, or it had gone on too long and the fellas got tired,” Mr Bethel said yesterday. “See the difficulty is, because it’s on the marine side, then an unmotivated entity, an entity that is not sensitised to that particular job – see it may be sensitised to catching smugglers, catching human traffickers, catching poachers (and) defence and so for this aspect of civil intervention into some crisis, perhaps there is a need for stronger sensitisation of the marine unit of the Royal Bahamas Defence Force to ensure that the sense of urgency that the family feels is also shared by those who are in the immediate vicinity and that the principle of no stone left unturned until we find this thing must prevail, because this is the second time now and I am only going based on what I heard. He continued: “And so if I feel that way about something like this, if my colleagues opposite here who sit beside me and if we feel as a body like that about a circumstance like that, how much worse does the family feel? “So we have to spend some time with our colleagues, and I don’t believe there is any ill will or any malice or whatever, but we have to work with our marines. We have to work with our Defence Force to get them to see that, yes even if it’s only in finding a crash site that is as important to the defence of the well-being of the Bahamian people, defending our well-being because how can we prevent such things happening unless we properly investigate each and every one? How can we show our true concern for the human beings involved if we call off the search on the slightest pretence? It cannot be the situation. It cannot happen. 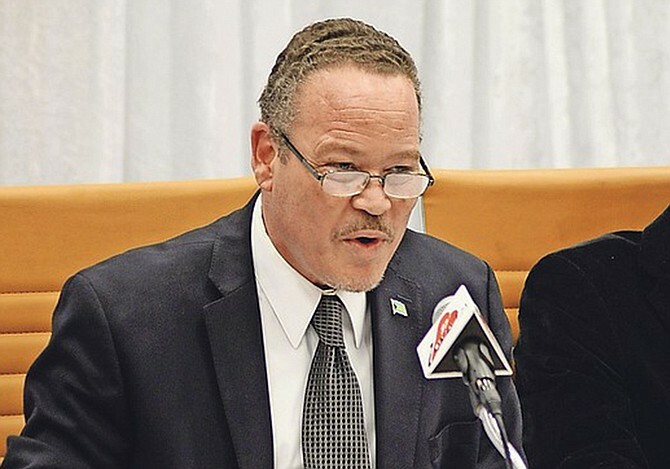 For his part, Senator Henfield questioned the country’s lack of rescue helicopters given the Bahamas’ makeup and the frequency of crashes in these waters. He also regretted that there is no legislation to govern crowdfunding in instances where money is needed to support rescue efforts. He said: “A mutual friend of Byron yesterday, who is still in shock, indicated to me that the wife with a 10-month-old child is still walking up and down that beach, and the beaches, not eating and just asking people to help me look in the bushes, look over there, check that sand and all of our hearts break. But you know it is unfortunate we live in a country in a day like today where we have mega resorts, but we don’t have our own rescue helicopters in this country. Opposition Senator Fred Mitchell added there was a need to beef up communication efforts between search agencies and families affected. “I know this young man very well, his wife, his family, his brothers, his father, his mother and they all live in the Fox Hill constituency, but quite apart from that, I want to join in the concerns about how this accident was dealt with,” Mr Mitchell said. “I said to a family when there is a homicide in this country the police have a designated person that’s assigned to coordinate with the family what the police are doing. Royal Bahamas Defence Force Commodore Tellis Bethel speaks on November 16th. The day after civilians discovered debris from missing pilot Byron Ferguson’s crashed plane, Royal Bahamas Defence Force Commodore Tellis Bethel vehemently defended his organization’s search and recovery efforts. He maintained that marines have made every effort for the past nine days in which the search “pushed the envelope” but was careful not to compromise safety. However, while Mr Bethel attempted to make a compelling case for these efforts since the incident last week Thursday, neither he nor other officials present could definitively tell reporters at what time the search was suspended in the hours following the crash in waters off Nirvana beach. Neither could they say when the search resumed. They did, however, present a list of reasons from vessels not having sufficient gas to there being low visibility, needing to mobilise additional equipment for a more extensive search, and suggesting fatigue as to why the search had been called off Thursday night. It was also contended that there had been no dive search efforts on Saturday and Sunday due to “inclement weather”. It also seems there was not a command centre set up for communication purposes, by Mr Bethel’s own admission. At several points in Friday’s press conference Mr Bethel seemed to be on the defensive saying at one point that people were taking an “I gotcha approach” in waiting for mistakes to be made, adding that some members of the press had withheld information to “whack somebody over the head with it”. Asked how civilians were successful in locating portions of the plane within 40 minutes of entering the water, Lieutenant Commander Derrick Ferguson said this area had previously been cleared by marines. Officials noted the tail of the small aircraft was spotted by RBDF vessel P115 and by several other persons and the spot marked. But they said Friday no efforts were made to retrieve it at the time because the priority then was to look for persons who could have been alive in the water. The concern, was further heightened, the commodore said, because of ambiguity about how many persons had been on board. Despite an initial statement from officials on the scene of the crash last Thursday that the search had been called off hours after the search, Commander Shone Pinder disagreed. He said: “The search never ceased. What we had was an ongoing effort to ensure initially the emphasis on discovering life and that effort continued. Recognising that we cannot predict when the call would go out for our vessels to respond the vessels that responded were not necessarily on full tanks. Asked to reveal specific times he said personnel returned to the site to dive at “first light” which would have been shortly before 6am. Pressed further on the time divers left and returned he said: “I’ll say this without getting specific with the time it was well after 0200 hours when our surface craft went in and of course we had to allow for our people an opportunity to get the right equipment to initiate a dive operation at first light. Later he said specific times would eventually be documented for public knowledge, but as an investigation is ongoing the information could not be released. Nonetheless, officials told reporters they did everything they could do in this situation, noting officials always first take into account a best-case scenario. As the search continues for Mr Ferguson, the criticisms have not fallen on deaf ears. Commodore Bethel said training is always ongoing at the force. “Rome was not built in a day. Sometimes you compare us to military services that been around for 250 over 300 years. We only been around for 38 years and we are well ahead in comparison to where they were many centuries ago so training and development is a major thing for us. As a matter of fact it was just several weeks ago the defence force conducted an advanced dive programme for its members so we are always training staff,” he said. 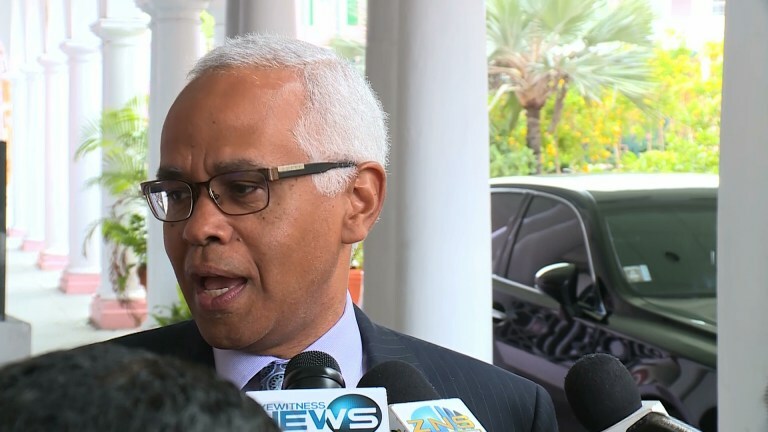 Aviation Minister Dionisio D’aguilar was unable to conclusively answer questions fielded by reporters Tuesday as to whether or not all airports in The Bahamas have functioning lights to accommodate regular, or emergency, night-time landings. The questions came in the wake of public outrage following rumours which suggested that the fate of Captain Byron Ferguson and his Piper Aztec plane, which went down in waters off the tip of western New Providence November 9, could have possibly had different results if all Family Island airports had functioning 24/7 airstrip lights. Unconfirmed reports have suggested that Ferguson passed three smaller airports while en route to Lynden Pindling International Airport (LPIA) last week Friday; the Chub Cay airport, Great Harbour Cay airport and the San Andros airport. It has been suggested that he was unable to land his malfunctioning aircraft at any of these airports because the lights had already been turned off for the night. “There are 28 airports [in the country] so forgive me if I don’t know if every single one of them has lights and if those lights are working. He revealed that in the event that there is an emergency where a distressed aircraft needs to land at a Family Island airport, pilots are supposed to contact Air Traffic Control (ATC) in New Providence. “They contact ATC, and then ATC reaches out to that particular airport; and some airports there is obviously no one there so they have to call someone to get in their car to go down there and turn on the lights,” he revealed. He was quick to note that the government has no plans to change this practice. “Obviously, there are a lot of remote airports and to equip and staff these airports 24/7 is a significant cost,” he noted. Tuesday marked four days of search efforts to locate Ferguson and his plane. Authorities provided no new details on their search and recovery efforts up to press time Wednesday. 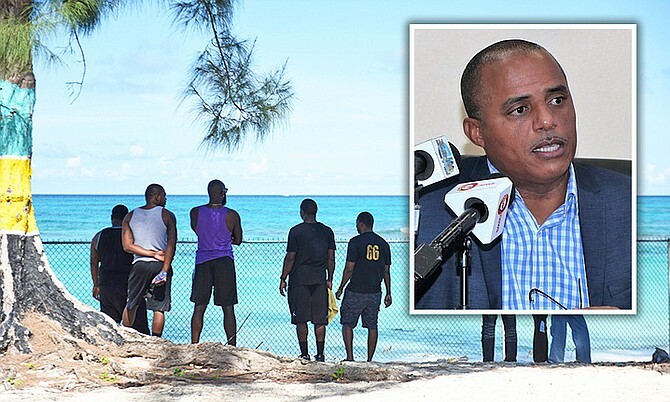 National Security Minister Marvin Dames (inset) and the scene at Nirvana Beach at the weekend. The family of missing pilot, Byron Ferguson contends that he did file a flight plan, despite conflicting reports that he did not. Still hoping and while still carrying on searches of their own, young Ferguson’s brother, Bjorn Ferguson said his brother who has at least 20-years of experience flying did file a flight plan, something the family and Air Accident Investigation Department have been able to confirm with Civil Aviation. However, National Security Minister, Marvin Dames told reporters otherwise outside Cabinet Tuesday morning. Mr. Dames told reporters that persons should be careful in their speculations concerning the incident Thursday night. “We have to be careful in how we are reporting, because this is sensitive and as I speak to you, the only thing I am thinking about is the family and what they are going through, and me having to be very careful as to what I say as to not exacerbate a very, very sensitive situation. “So, our hearts go out to the family. I know a few of them and we will continue to do whatever we can to ensure that we work to bring some closure to this matter,” Mr. Dames said. 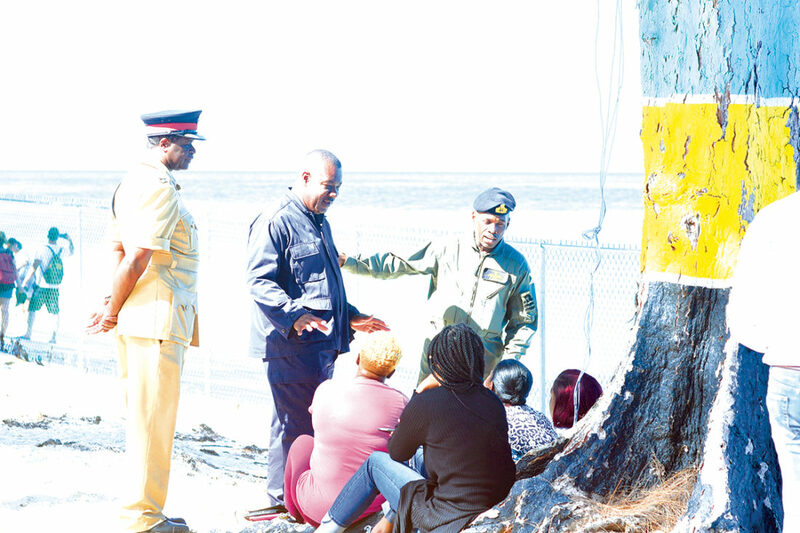 As for failed attempts to secure the ill-fated aircraft once it was spotted shortly after crashing in waters off Nirvana Beach Thursday night, Minister Dames said there are a number of reasons this may not have happened. “When they were approaching, a little piece of the aircraft could have been seen. As they got close the aircraft disappeared. “So, we have to be extremely careful when we say aircraft; we give the impression that here is this big aircraft that they saw lying on the water; that is not so. “We have to leave it up to the search team and the investigators to let them do their jobs and not muddle what they are doing,” said the Minister. The family says this contradicts what the person in charge of the search and rescue would have reported, that initially the plane was found. Mr. Dames suggested that there could be a number of reasons divers were not sent into waters on last Thursday, procurement of life being one of them. “Those teams out there have been working tirelessly, and always remember in search and rescue, when teams are out there and they’re working their first area of focus is the protection of life. “You are trying to preserve or trying to protect the life of those who may have been involved in the incident; but we have to always be cognizant that we also have to ensure, that’s the first responders that is, and this is no different anywhere the world over, they have to ensure that they too preserve their lives. “Often times they are going to a very, very risky and dangerous situation, where one bad decision could result in them losing their lives as well,” Mr. Dames said. The Ferguson’s family have gotten local and foreign pilots to assist with an aerial search of the Nirvana Beach and surrounding areas. 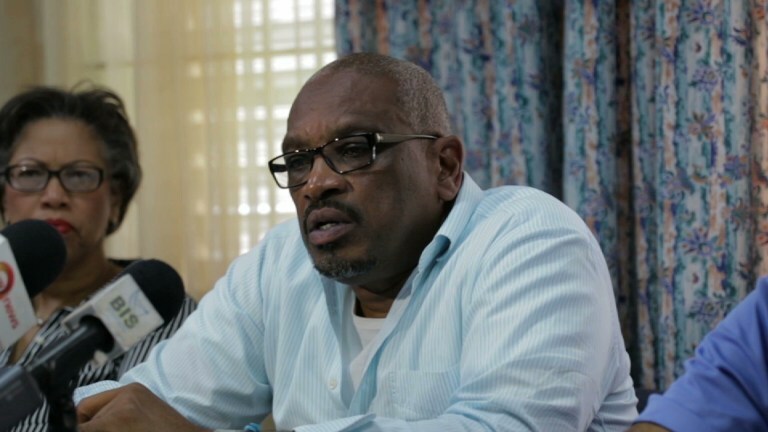 As the search for missing pilot Byron Ferguson continues, National Security Minister Marvin Dames defended officials against criticism by saying that law enforcement has extended every effort to resolving this matter. In an interview with The Tribune yesterday, Mr Dames said as soon as information about the crash was reported, law enforcement mobilised. He also said no flight plan was filed for the aircraft, as he appealed to the public not to make assumptions. Regarding the search, Mr Dames added there is still “hope” that officials can find Mr Ferguson. Yesterday, Royal Bahamas Defence Force (RBDF) Commissioner Tellis Bethel reiterated to The Tribune that the perimeter of the crash has extended. “The search was expanded yesterday (Sunday) to include waters and (coastlines) off of the east coast of North Andros, including the Joulter Cays and the south coast of the Berry Islands including Chub Cay and Whale Cay,” the commodore said. Bahamas Air Accident Investigation Department Operations Investigator Kendal Dorsett Jr also said yesterday that with a lack of physical evidence, authorities are looking at “other avenues” that could have contributed to the incident. “Because of that, we have requested a weather study from the National Transportation Safety Board in the United States and we will also be looking at the maintenance records of this aircraft and also the ATC related data in relation to this case,” Mr Dorsett said. During a press conference held on Sunday, relatives of Mr Ferguson expressed dissatisfaction with the way officials have conducted search and rescue efforts in the wake of the plane crash in the waters off Nirvana Beach on Thursday night. Mr Dames said he was “taken aback” by the criticism, given his knowledge of how quickly officials mobilised in response to the crash. 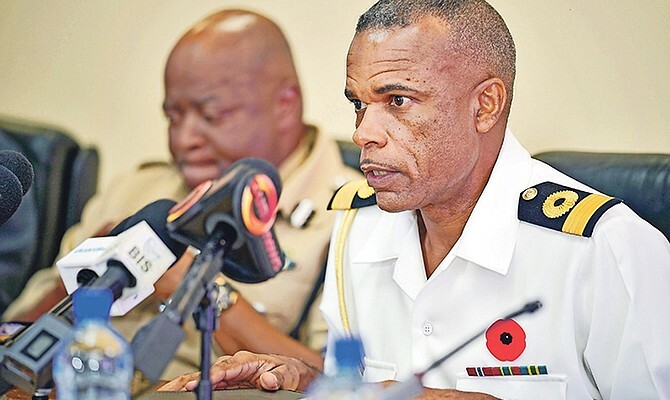 “When this matter was reported to the authorities on Thursday night…I was in communication with (Commodore Bethel) and the commissioner (of police),” Mr Dames said. “I was also in communication with the minister of tourism, who has responsibility for civil aviation. “We take that (plane crashes) very seriously. And so immediately as that information came in, the authorities activated their machinery, almost immediately. The (RBDF) responded, the police responded, we got the assistance from the US who mobilised the helicopter almost immediately under the umbrella of (Operations Bahamas Turks and Caicos) OPBAT. When asked about the family’s critiques that no divers went into the waters on Thursday night, Mr Dames underscored preservation of life is paramount in these situations. “The first order of business is the preservation of life,” Mr Dames said. “Now, I couldn’t say what the conditions were at the time, and what the officers were up against. We could all sit back and be Monday morning quarterbacks, but if you look at search and rescue, anywhere the world over, and you see how it is conducted— sometimes you have rough waters and you may want to go in and execute a search, but you can’t because the waters are rough. Regarding the family’s criticisms that the plane was not marked or tracked before authorities left the scene, Mr Dames said he could not speak to that matter as the investigation is ongoing. He also warned against the spreading of false information, noting that as far as officials are aware, no flight plan was filed for the ill-fated trip. However, Mr Dames also said he is sympathetic to the family’s plight. “Every family, I included, if I were faced with that situation, would want to ensure that the authorities are doing all that is humanely possible to return their loved one or loved one’s home,” Mr Dames said. “And so I am not faulting the family whatsoever. “We continue to search and it is always our hope that we can find life,” he added, referring to the incident when Bahamian sailor Samuel Leroy Moss Jr was found alive after being adrift at sea for two weeks. Family members and loved ones of one of the pilots that went down in Thursday’s unfortunate plane crash were brought to tears yesterday as they expressed their extreme frustration with search and rescue attempts. 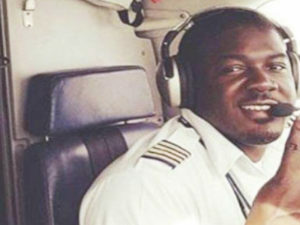 Ashton Ferguson, brother of pilot Byron Ferguson told reporters that that though the men have yet to be found, they remain hopeful; but are bracing themselves with the harsh reality that their loved one may be gone forever. Mr. Ferguson described his brother as an experienced pilot that flew internationally, and had clarity of mind when on the job. He also said that no one officially reached out to the family, and the Commodore of the Royal Bahamas Defense Force met with them yesterday indicating that they will be widening their perimeter of search. However, this was after they would have made contact and agitated a Member of Parliament. Mr. Ferguson recalled that night, indicating that the search for his brother was called off before midnight with no divers entering the water, leaving the family with many unanswered questions. The family also indicating that the search and rescue team did not mark the plane’s exact location that night, further delaying rescue efforts. The family said that they are due and deserve facts and professionalism from those responsible for conducting this search and investigation. They added that they will not stop until they reach a resolution. Family members and close friends of those missing following a plane crash in waters off of Nirvana Beach on Thursday night, patiently wait for updated news from officials. Had everything gone as planned, Byron Ferguson and his parents would have been flying to South Africa to celebrate his father’s birthday yesterday, but instead his family and authorities were still conducting a widespread search for him after his plane crashed off western New Providence on Thursday night. While Ferguson’s family remains hopeful that he is still alive, authorities said it is unlikely that anyone survived the crash in waters about a mile north of Nirvana Beach. “He was scheduled to return to work today in South Africa,” said Ferguson’s brother, Bjorn, who spoke to the media yesterday at Nirvana Beach, where dozens of their relatives and friends gathered. Police said shortly after 8 p.m. Thursday, Air Traffic Control (ATC) reported that a plane had disappeared from the radar near Nirvana Beach after the pilot reported that the door to the plane had flown open. 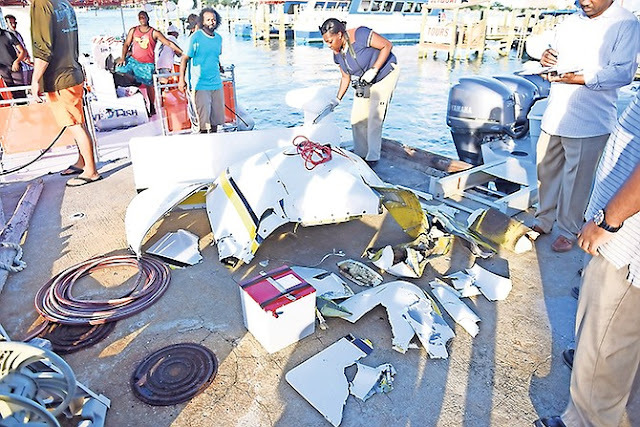 The six-seater Piper Aztec aircraft plunged into the sea two nautical miles from the airfield at Lynden Pindling International Airport. Ferguson, 34, and one passenger were reportedly on the plane when it crashed, according to authorities. However, conflicting reports from his family suggest he was the only one aboard, as the person who was supposed to fly with him never got on the plane. “We are not giving up on my husband,” said Ferguson’s wife, Anya. “He is an excellent pilot, and I’m sure he is out there. “I’m not giving up on my husband and I don’t expect anyone out here to give up on him. Ferguson is a father of two, a nine-month-old son and an 11-year-old daughter. He is the son of former media personality Agnes Ferguson. His family described him as an experienced pilot, who had been flying since he was 14. He graduated from Florida Air Academy and had his license since 1999, according to his brother. “We are confident in Byron’s ability and the actions he took, up until the plane landed,” Bjorn said. “This was obviously a controlled landing… He was losing altitude. He knew he could not make it to LPIA. He told his friend to track him; he was going to ditch this plane there. Commander Shone Pinder, the airway commanding officer for the Royal Bahamas Defence Force, said on Friday there were no clear indications of bodies in the plane on Thursday during the original search when a portion of the aircraft was still above the water. However, the plane was no longer at that location when divers returned to the scene on Friday morning. Officials believe the plane may have shifted from its original position due to a change in tide. As they gathered on Nirvana Beach yesterday, Ferguson’s family criticized authorities over the search and rescue efforts. “Speaking for the family, [we are] expressing our extreme frustration and our dissatisfaction with the search and rescue attempt for my brother. The Ferguson family at Nirvana Beach yesterday as the search for pilot Byron Ferguson continued. Pointing to the alleged lack of communication with family members, the inability to secure the plane on Thursday night or send divers to search it, and the lack of visibility of officials searching the area in the days following the crash, Ferguson’s other brother, Anvon, called the entire operation incompetent. “That’s just insane that this day, in 2018, in The Bahamas, a plane crashed and you have no divers available until the next morning, at light, when you have clear indication of where the plane is. Relatives have been conducting their own private search for Ferguson since Friday, using personal planes, boats and jet skis. They said their search will continue until they can get to a conclusion. The Royal Bahamas Defence Force is continuing the search for Byron Ferguson, the pilot of the small plane that crashed in waters off Nirvana Beach on Thursday night, and has widened the perimeter of the initial search boundary. At a press conference on Nirvana Beach on Sunday, one of Mr. Ferguson’s brothers said the seasoned pilot experienced difficulties with the plane’s door during flight and contacted Air Traffic Control. Sometime later he experienced engine problems. Dr. Ashton Ferguson, Mr. Ferguson’s younger brother, said relatives are not satisfied with initial search and rescue attempts. Dr. Ferguson said according to his brother’s flight plan, Mr. Ferguson left the West Palm Beach airport in Florida at approximately 7:26 pm on Thursday. Relatives have said only the pilot was aboard the plane, contradicting previous police reports – two people were originally supposed to be on board. “The information that we obtained, my brother, he encountered difficulties about 40 miles off of the coast with his door,” Dr. Ferguson said. “He radioed as such to the Air Traffic Control. I think about 15 miles, again, he contacted again with engine problems. 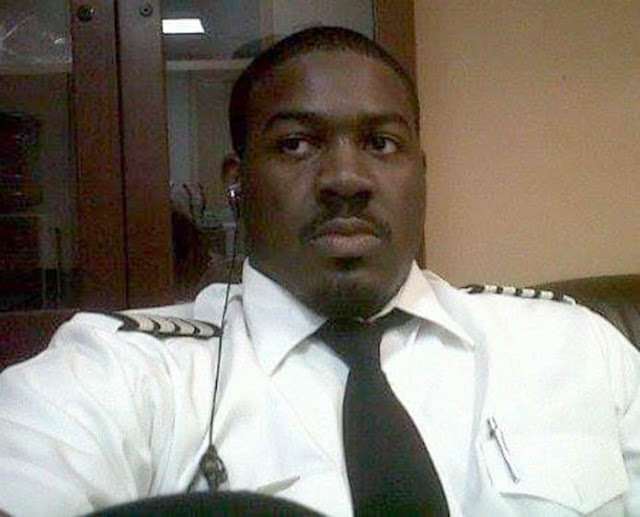 Relatives said Mr. Ferguson is a graduate of the Florida Air Academy who has been flying since he was 14-years-old. He obtained his pilot’s licence in 1999 and is currently working out of North Africa for a South-African headquartered company. It is unlikely that anyone survived a flight that crashed in waters about a mile north of Nirvana Beach on New Providence Thursday night, Assistant Commissioner of Police Leamond Deleveaux said yesterday. “Well, I think we’re in the recovery stage now, it’s fair to say,” Delevaux said. A six-seater Piper Aztec aircraft plunged into the sea two nautical miles from the airfield at Lynden Pindling International Airport. Police said shortly after 8 p.m. Thursday, Air Traffic Control (ATC) reported that a plane had disappeared from the radar near Nirvana Beach after the pilot had reported that the door to the plane had flown open. The pilot, Byron Ferguson, 34, and one passenger were on the plane when it crashed, according to family members who were at the staging area for the search at Nirvana Beach yesterday. Those family members did not wish to speak on the record. Kendall Dorsett Jr., the operations investigator for the Air Accident Investigation Department (AAID), said after reports were received from ATC, standby emergency protocols were initiated. “Search and rescue was subsequently launched by the Royal Bahamas Defence Force, Royal Bahamas Police Force, U.S. Coast Guard and BASRA,” said Dorsett in a statement. Commander Shone Pinder, the airway commanding officer for the Royal Bahamas Defence Force, said there were no clear indications of bodies in the plane on Thursday during the original search. “There were no visible persons at the time based on what I have been informed of,” Pinder said. He added: “Remember the initial response was intended to look more so for survivors and get on scene as soon as possible to render immediate assistance. Pinder said defence force officers were combing the shoreline from “the Compass Point area that’s intended to come to this area (Nirvana Beach) and pass it and go to the west” to see if any debris from the plane could be found. Both Pinder and Deleveaux confirmed that the plane was not in its original position when divers returned to the scene on Friday morning. Deleveaux told The Nassau Guardian that authorities believe the plane may have shifted from its original position. “We still have teams of defence force and police officers in the Nirvana Beach area continuing the search,” he said. “We’re told that the plane may have relocated from its original position that it was in last night and so we continue to search. We continue to search as long as necessary. “We’ll go until sunset this evening, until dark fall and then tomorrow again we’ll resume search. We want to bring some sort of relief to the persons who were on that aircraft. “As I indicated last night, we told you last night that the plane, parts of the plane have been located by the defence and police officers. They had the coordinates. Deleveaux said the change in tide led to plane moving. “You know that the tides that come in and out will usually take anything that’s in its path out and so it may have been taken to a different area,” he said. The door on the old Aztruck is straightforward. You can foul up closing it, but it's not any biggie, as far as flying the plane is concerned. The nose baggage door is another matter, though. If that hatch opens, and anything falls out, you're most likely going to lose your critical engine, which contains the hydraulic pump. If you're at or below VMC, you will have your hands full keeping the beast level. Some folks will mention the infamous Triangle, but they'll be grasping at rather flimsy straws. You obviously don't know anything about an AzTec! The left engine is critical therefore not on the side of the nose baggage door and by chance the aircraft is only equipped with one hydraulic pump it is also on the left engine. "Crashed due to unknown circumstances." This is the only true statement at the time of notification. The Ferguson family is unhappy with everything and everybody. If I fly offshore beyond glide to land at night I do not have any expectation to be rescued. I think it unreasonable to believe otherwise.